The principal act of worship for Christians is the Eucharist, the Great Thanksgiving (Lord’s Supper, Holy Communion, the Mass). We gather regularly around the table to offer our sacrifice of praise and thanksgiving. As stewards of all God has lovingly given us, we present ourselves and our gifts of bread, wine, and treasure (money). As the bread and wine are changed into the Body and Blood of Jesus, so too are we changed. Called by God through Baptism, in the Eucharist we are equipped and empowered for work in the world, being Christ’s hands and feet in loving service to all. At the Church of the Redeemer the Holy Eucharist is celebrated each Sunday at 8 am (said) and 10 am (with music). On Wednesday evenings there is a celebration of the Eucharist at 6 pm. On Holy Days the Eucharist is typically celebrated. There is a Taize Liturgy the fourth Sunday of each month. During Lent Morning Prayer is said weekdays at 9 am. 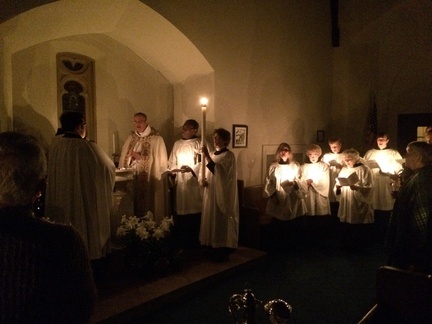 Throughout the year, special seasonal liturgies are offered. Please check these pages for the schedule. You are cordially invited to join us for any liturgy. All are welcome and invited. There’s a place at the table for you!